What the heck are Brand Guides & Why your Biz Needs them — MKW Creative Co. Brand Guides, Brand Styles, Brand Manuals, Brand Bibles... Although there are many names for what Brand Guides are, they essentially are made up of the same things. In this blog, I am breaking down what goes into the Brand Guides I design for my clients! ME! But seriously... A brand designer is an individual with graphic design skills, but also a knack for long-term brand visualization and business strategy. This person keeps your long-term business goals and applications in mind throughout the design process including (but not limited to): considering how your logo will translate between print and digital, designing submarks that can be used as social media avatars, and creating custom patterns and illustrations that uniquely communicate your product or service. A good brand designer will take these elements, and beautifully package them into a multi-page PDF Brand Style Guides (why you’re reading this blog in the first place). So let’s get to the nitty gritty and break down what exactly goes into Brand Style Guides. *Not all guides follow this cookie-cutter formula, but may change due to the scope of the project. I just want a logo...why do I need a Brand? A LOGO is a mark or a symbol, or a combination of typography that is used as an identifier for a brand. Think the Nike Swoosh, Netflix’s White on Back text, Target’s Target, or Apple’s… well Apple. These symbols and marks become synonymous with the business name (so much so that they can be shown without the name altogether). A BRAND is the logo + ALL OF THE SUPPORTING ELEMENTS that make the logo and the small business successful. Essentially, a brand is the compilation of all the ways that a business communicates. Most obviously, this means visuals; but branding appeals to all of the senses. It is how a business talks, shares stories, smells (remember walking through the cloud of cologne in Hollister circa 2009?) and the way it makes you feel. Think of it like this... your brand is your small business's personal style. Think of someone that you know who has great style -- always dresses sharp, hair done, nails done errythang did (2010 Drake fans?). What if that person suddenly showed up in holey sweatpants and a pizza-stained sweatshirt to the office? You wouldn't recognize them. Or, what if that person was constantly changing their look from polished professional, to boho, to old hollywood glam, to grunge rock? It would be hard to trust someone who seems like they don't know who they are or what they offer. THIS is why it is important to invest in a well designed brand. What's included in Brand Guides? 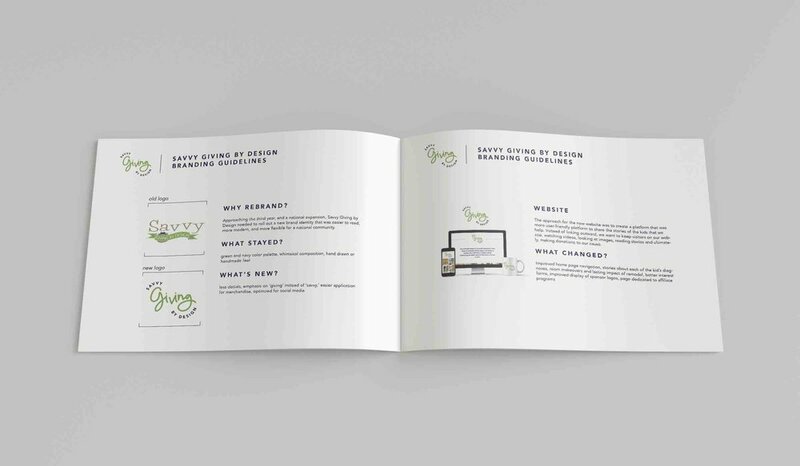 The Cover Page is the start of the Brand Guide PDF. I usually make the guides size at 11x8.5" in the off chance that my clients might want to print a hard copy. This first page shows the logo and sometimes the title "Brand Guides" and who is it designed by, although not necessary. The first page of the Brand Guides introduces you to the brand. This is where you will often display the Mission Statement, Vision Statement, Core Values and Ideal Client Avatar. This page really sets the tone for the rest of the Guide. *Don't have your mission and vision statements yet? I always suggest that my clients work with a business coach before we get started on designing their brand. It is much more efficient to design a brand when you know how and who the brand should be speaking to! My go-to biz coach is Lauren from Right Hand Business Coach. Connect with her here. A logo design should not be tampered with once it is in final format. Treat the logo like a completed piece of art and use it with the designer’s intentions in mind. This page is used to show which logo shall be used to represent the brand in most cases (but not always) and should become the visual identifier for the brand from that point forward. Although not totally necessary, most brands need more than one version of their logo. Here are examples of the variations of logos that may be included in your branding guides and how you might use them. Note: the usage for said logos is explained in your brand guides. Standard Logo: Your standard logo is the logo you will use MOST OFTEN to identify your brand. This should include the icon, symbol or doodle + your business name spelled out in your brand typography. This is the logo that you want to use on print material like business cards and on your website. The standard logo should allow for a certain clearance margin, meaning that the logo should always be displayed with a consistent amount of spacing around it that is scalable. Horizontal Variation or Expanded Variation: A horizontal logo variation would be a version of your logo that is better optimized for a horizontal format. You would use a horizontal format for example at the top of letterhead, as a facebook cover photo, or email newsletter. An expanded variation might include more information than the standard logo. Examples would be a tagline, city, estab. date, or any other information that you would want displayed. You would only use the expanded variation of your logo if it remains readable at the scale in which it is being displayed. Submark: A Submark is an abbreviated version of a standard logo. Submarks are great for Social media graphics and profiles, favicons, or anywhere else where the standard logo would be unreadable. Get more brand design goodies! Sign up with your email address for more blogs, tips, tricks and freebies! Brand Guides include the brand colors. This is the color palette from which you should make all of your branded collateral. 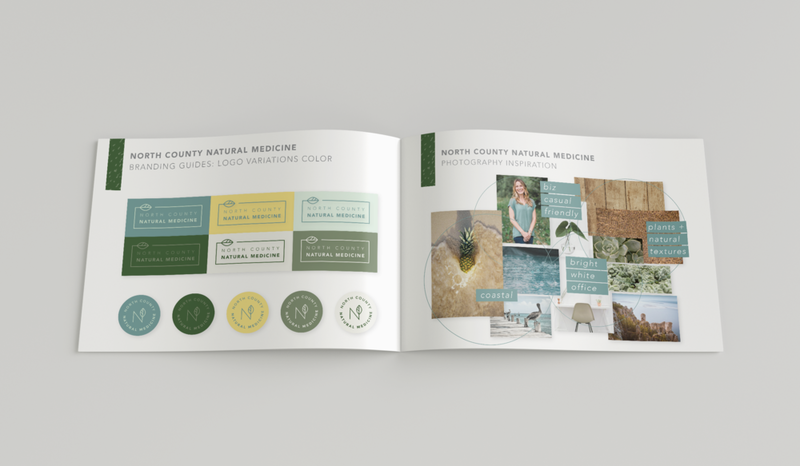 The Brand Guides will spell out exact color being used so that you can ensure that all of your graphics, web, print and other brand materials are using consistent color. Colors can be tricky. There are a few color languages to be aware of: Hex Code, RGB, CMYK, and Pantone. I always provide hex code colors in the branding guides. Note: Printing Merchandise like t-shirts and other swag can give you wacky colors. Always request a print sample before purchasing. Moodboards are collections of images that communicate the overall mood of your brand. This can include textures, patterns, graphics, and photography. For new brands, I will select stock photography that fits the overall theme (I'll give them to you, don't worry). Note: At the beginning of the design process, I set up a Pinterest board with Inspiration. We cannot use the images from Pinterest unless they are royalty-free. The images on the Pinterest board belong to someone else, and are not free to use just because they are on the internet. All the more reason to hire a photog and get that ORIGINAL brand photography for your brand! Read: Branded Photography: What it is and Why you need it for your Small Biz Showing your photographer your moodboard is a great way to make sure that the images you create fit the brand we've designed. Icon sets and Illustrations are a great way to continue to communicate your brand in a unique eye-catching way. You can use icon sets or illustrations to break up text on your website, print materials and even upcycle them to social media graphics. Icon sets and Illustrations are great for showing things like: your services, your core values, your process, etc. Patterns and Textures can be super helpful for building your brand across all platforms. I love taking elements of the logo and creating patterns with them. Finding complimentary patterns for your brand continue to communicate the overall mood and vibe you are going for (and should attract your ideal client!) You can use your brand patterns and textures for: backgrounds on web pages, Pinterest Graphic backgrounds, business cards, brochures, email newsletters, and social graphics. Now THIS is the fun part! Brand Guides really come to life here at the end when you can see how the logo and brand elements might function IRL. I create a collection of photoshop mock ups for how the brand should be displayed across different mediums. Some examples of Collateral Mock Ups would be: business card, canvas bag, basic tee, hang tag, thank you card, letterhead, signage, websites, social media platforms, etc.